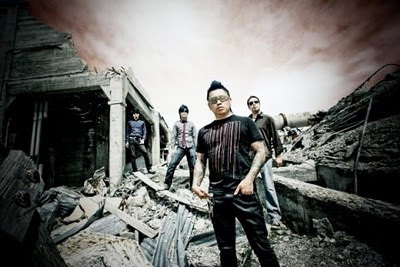 The Slants features vocalist Aron Moxley, a Vietnamese refugee who grew up in Astoria, Oregon; bassist Simon Young, a Chinese-Taiwanese from San Diego; guitarist Johnny Fontanilla, Filipino-Mexican also from San Diego; and drummer/vocalist Tyler Chen, a Chinese-German who has lived throughout the Northwest. Celebrating the release of their first-ever music video at Dante’s on Saturday, January 8th, OMN caught up with bassist Simon Young. You consider yourselves “one of the only, if not only, all-Asian dance rock bands in the country.” Is this true? Who else is out there? To our knowledge, we are the first and only all Asian-American dance rock band in the world. There’s a few other acts out there doing the dance rock/synth-pop sound that have a token Asian player (such as VHS or Beta) but no one that we’re aware of that is doing something quite the same as us. Pageantry has been said to be “harder-hitting,” “guitar fueled” and “a slight deviation from the synthesizer-driven” debut. Tell us how you have changed and grown. Unlike most bands, we started recording our first album (Slanted Eyes, Slanted Hearts) even before our first show. As we progressed and brought in more musicians, it started leaning towards a more energetic live show. The singer, Aron, and I both come from punk rock backgrounds so we always leaned towards a heavier sound. So after our first album was completed and released, we knew we wanted something a little more rock-driven. But with so many lineup changes (11 different members in the first 3 years), it was tough to begin work on a new release. best of 2010... now, what's next? q/a : where has the blow been? the dandys still rule, ok?